For other uses, see Smolensk (disambiguation). The walled city in the center of Smolensk (along with the outskirts) was destroyed several times throughout its long history because it was on the invasion routes of the Mongol Empire, Polish–Lithuanian Commonwealth, First French Empire and Nazi Germany. Today, Smolensk is noted for its electronics, textiles, food processing, and diamond faceting industries. The name of the city is derived from the name of the Smolnya River. The origin of the river's name is less clear. One possibility is the old Slavic word "смоль" (smol) for black soil, which might have colored the waters of the Smolnya. An alternative origin could be the Russian word "смола" (smola), which means resin, tar, or pitch. Pine trees grow in the area, and the city was once a center of resin processing and trade. The Byzantine emperor Constantine VII (r. 913–959) recorded its name as "Μιλινισκα" (Miliniska). The city is located in European Russia on the banks of the upper Dnieper River, which crosses the city within the Smolensk Upland, which is the western part of the Smolensk–Moscow Upland. The Dnieper River flows through the city from east to west and divides it into two parts: the northern (Zadneprove) and southern (center). Within the city and its surroundings the river takes in several small tributaries. In the valleys are stretched streets, high ridges, hills, and headlands form the mountain. 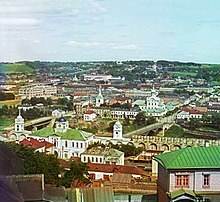 Smolensk is situated on seven hills (mountains). The old part of the city occupies the high, rugged left (south) bank of the Dnieper River. The area features undulating terrain, with a large number of tributaries, creeks and ravines. Smolensk is among the oldest Russian cities. The first recorded mention of the city was 863 AD, two years after the founding of Kievan Rus'. According to Russian Primary Chronicle, Smolensk (probably located slightly downstream, at the archaeological site of Gnezdovo) was located on the area settled by the West Slavic Radimichs tribe in 882 when Oleg of Novgorod took it in passing from Novgorod to Kiev. The town was first attested two decades earlier, when the Varangian chieftains Askold and Dir, while on their way to Kiev, decided against challenging Smolensk on account of its large size and population. The first foreign writer to mention the city was the Byzantine Emperor Constantine Porphyrogenitus. In De Administrando Imperio (c. 950) he described Smolensk as a key station on the trade route from the Varangians to the Greeks. The Rus' people sailed from the Baltics up the Western Dvina as far as they could then they portaged their boats to the upper Dnieper. It was in Smolensk that they supposedly mended any leaks and small holes that might have appeared in their boats from being dragged on the ground and they used tar to do that, hence the city name. The Principality of Smolensk was founded in 1054. Due to its central position in Kievan Rus', the city developed rapidly. By the end of the 12th century, the princedom was one of the strongest in Eastern Europe, so that Smolensk Dynasty frequently controlled the Kievan throne. Numerous churches were built in the city at that time, including the church of Sts. Peter and Paul (1146, reconstructed to its presumed original appearance after World War II) and the church of St. John the Baptist (1180, also partly rebuilt). The most remarkable church in the city is called Svirskaya (1197, still standing); it was admired by contemporaries as the most beautiful structure east of Kiev. Smolensk had its own veche since the very beginning of its history. Its power increased after the disintegration of Kievan Rus', and although it was not as strong as the veche in Novgorod, the princes had to take its opinion into consideration; several times in 12th and 13th centuries there was an open conflict between them. Although spared by the Mongol armies in 1240, Smolensk paid tribute to the Golden Horde, gradually becoming a pawn in the long struggle between Lithuania and the Grand Duchy of Moscow. The last sovereign monarch of Smolensk was Yury of Smolensk; during his reign the city was taken by Vytautas the Great of Lithuania on three occasions: in 1395, 1404, and 1408. After the city's incorporation into the Grand Duchy of Lithuania, some of Smolensk's boyars (e.g., the Sapiehas) moved to Vilnius; descendants of the ruling princes (e.g., the Tatishchevs, Kropotkins, Mussorgskys, Vyazemskys) fled to Moscow. With tens of thousands of people living there, Smolensk was probably the largest city in 15th-century Lithuania. Three Smolensk regiments took part in the Battle of Grunwald against the Teutonic Knights. It was a severe blow to Lithuania when the city was taken by Vasily III of Russia in 1514. To commemorate this event, the Tsar founded the Novodevichy Convent in Moscow and dedicated it to the icon of Our Lady of Smolensk. In order to repel future Polish–Lithuanian attacks, Boris Godunov made it his priority to heavily fortify the city. The stone kremlin constructed in 1597–1602 is the largest in Russia. It features thick walls and numerous watchtowers. Heavy fortifications did not prevent the fortress from being taken by the Polish–Lithuanian Commonwealth in 1611 after a long twenty-month siege, during the Time of Troubles and Dimitriads. Weakened Muscovy temporarily ceded Smolensk land to the Polish–Lithuanian Commonwealth in the Truce of Deulino and for the next forty-three years it was the seat of Smolensk Voivodeship. To recapture the city, the Tsardom of Russia launched the so-called "Smolensk War" against the Commonwealth in 1632. After a defeat at the hands of king Wladislaw IV, the city remained in Polish–Lithuanian hands. In 1632, the Uniate bishop Lew Kreuza built his apartments in Smolensk; they were later converted into the Orthodox Church of Saint Barbara. The hostilities resumed in 1654 when the Commonwealth was being affected by the Khmelnytsky Uprising and the Swedish deluge. After another siege, on September 23, 1654, Smolensk was recaptured by Russia. In the 1667 Truce of Andrusovo, the Polish–Lithuanian Commonwealth renounced its claims to Smolensk. Smolensk has been a special place to Russians for many reasons, not least for the fact that the local cathedral housed one of the most venerated Orthodox icons, attributed to St. Luke. Building the new Cathedral of the Assumption was a great project which took more than a century to complete. Despite slowly sinking into economic backwater, Smolensk was still valued by Tsars as a key fortress defending the route to Moscow. It was made the seat of Smolensk Governorate in 1708. 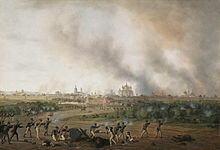 In August 1812, two of the largest armies ever assembled clashed in Smolensk. During the hard-fought battle, described by Leo Tolstoy in War and Peace, Napoleon entered the city. Total losses were estimated at 30,000 men. Apart from other military monuments, central Smolensk features the Eagles monument, unveiled in 1912 to mark the centenary of Napoleon's Russian campaign. At the beginning of World War I, the 56th Smolensk Infantry Division was first assigned to the First Army of the Imperial Russian Army. They fought at the Battle of Tannenberg. It was subsequently transferred to the 10th Army and fought at the Second Battle of the Masurian Lakes. In March 1918, while the city remained a part of Russia, Belarusian People's Republic, proclaimed in Minsk under the German occupation, declared Smolensk a part of it. In February–December 1918, Smolensk was home to the headquarters of the Western Front, North-West Oblast Bolshevik Committee and Western Oblast Executive Committee. On January 1, 1919, the Byelorussian Soviet Socialist Republic was proclaimed in Smolensk, but its government moved to Minsk as soon as the German forces had been driven out of Minsk several days later. After the Revolution, for inclusion in its composition as claimed Smolensk Belarusian People's Republic and the Byelorussian SSR. [clarification needed] Since April 1918 Smolensk was the center of the Western Region, which is based on January 1, 1919, Byelorussian SSR was formed. January 7 BSSR government moved from Minsk and Smolensk already January 16, 1919 decision of the Central Committee of the RCP Smolensk region was transferred to the RSFSR. In 1920 was held the new provincial census, according to which the Russian population prevailed over Belarus, but the Belarusian party leadership until 1926 leaves no hope for the inclusion of Smolensk in the Belorussian SSR. In 1940, 18 km (11 mi) from Smolensk, the Katyn Massacre occurred. During World War II, Smolensk once again saw wide-scale fighting during the first Battle of Smolensk when the city was captured by the Germans on July 16, 1941. The first Soviet counteroffensive against the German army was launched in August 1941 but failed. However, the limited Soviet victories outside the city halted the German advance for a crucial two months,[dubious – discuss] granting time to Moscow's defenders to prepare in earnest. Camp 126[further explanation needed] was situated close to Smolensk and at this time Boris Menshagin was mayor of Smolensk, with his deputy Boris Bazilevsky. Both of them would be key witnesses in the Nuremberg Trials over the Katyn massacre. Over 93% of the city was destroyed during the fighting; the ancient icon of Our Lady of Smolensk was lost. Nevertheless, it escaped total destruction. In late 1943, Göring[dubious – discuss]had ordered Gotthard Heinrici to destroy Smolensk in accordance with the Nazi "scorched earth" policy. He refused and was punished for it. The city was finally liberated on September 25, 1943, during the second Battle of Smolensk. The rare title of Hero City was bestowed on Smolensk after the war. 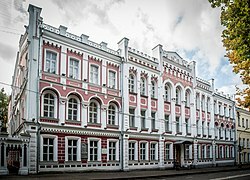 After the Germans captured the city in 1941, they found the intact archives of Smolensk Oblast Committee of the Communist Party, the so-called Smolensk Archive. The archive was moved to Germany, and a significant part of it eventually ended up in the United States, providing Western scholars and intelligence specialists with unique information on the local workings of the Soviet government during its first two decades. The archives were returned to Russia by the United States in 2002. On April 10, 2010, a Tu-154 military jet carrying Polish president Lech Kaczyński, his wife, and many notable political and military figures crashed in a wooded area near Smolensk while approaching the local military airport. All ninety-six passengers died immediately on impact. The purpose of the visit was to commemorate the 70th anniversary of the Katyn massacre, in which some 22,000 Polish POWs were murdered by the NKVD. In 2013, archaeologists of the Russian Academy of Sciences discovered and unearthed in the ancient temples in Smolensk dated to middle to second half of the 12th century, built on the left bank at the time the city was the capital of Smolensk principality. From unique object preserved walls in some places low, in others the height of human growth. In September 2013, Smolensk widely celebrated the 1,150th anniversary with funds spent on different construction and renovation projects in the city. In celebration the Central Bank of Russia issued commemorative coins made of precious metals. Owing to its long and rich history, Smolensk is home to many fine examples of Russian architecture ranging from the Kievan Rus period to post-WWII Stalinist architecture. Although the city was destroyed several times over, many historically and culturally significant buildings still remain, including a large number of churches and cathedrals. The most famous of these are the Cathedral of the Assumption, the Immaculate Conception Church, and the Church of St. Michael the Archangel, which is one of the few structures remaining in Russia from before the Mongol invasion. The Smolensk Kremlin, built at the end of the 16th century during the reign of Tsars Fyodor I Ioannovich and Boris Godunov, under the supervision of the architect Fyodor Kon, is one of the greatest achievement of Russian medieval architecture and military engineering. Being the site of many great battles in Russian history, Smolensk is home to many monuments commemorating its rich military history. Smolensk serves as the administrative center of the oblast and, within the framework of administrative divisions, it also serves as the administrative center of Smolensky District, even though it is not a part of it. As an administrative division, it is incorporated separately as Smolensk Urban Okrug—an administrative unit with the status equal to that of the districts. As a municipal division, this administrative unit also has urban okrug status. Smolensk has a warm-summer humid continental climate (Köppen climate classification Dfb). Smolensk has several factories including the Smolensk Aviation Plant and several electronics and agricultural machinery factories. Smolensk is located on the M1 main highway and Moscow–Brest Railway. 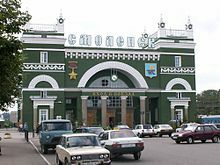 Since 1870, there is a railway connection between Smolensk and Moscow. Local public transport includes buses and trolleybuses. Public transportation network includes buses, trolleybuses, trams, and marshrutkas. There are two airports located in the outskirts of the city; Smolensk South (civilian) and Smolensk North (military); however, there are no regular flights scheduled to Smolensk South Airport. Smolensk is home to the Smolensk State University (SMOLGU) and the Smolensk State Medical University (affiliated as university in 2015) (SSMU); together with colleges of further education and other educational institutes. Michail Ancaŭ (1865-1945), Belarusian composer, choral conductor, choirmaster and teacher. Smolensk Strait between Livingston Island and Deception Island in the South Shetland Islands, Antarctica is named after the city. ^ "Смоленский городской Совет - Официальный сайт органа местного самоуправления". www.smolsovet.ru. ^ Алексеев, Л. В. (1980). Смоленская земля в IX-XIII вв (in Russian). Moscow: Наука. pp. 111–115. ^ Marples, D. (2016). Belarus: From Soviet Rule to Nuclear Catastrophe. Springer. p. 11. ISBN 978-0230378315. ^ Sanford, George. Katyn and the Soviet Massacre of 1940: Truth, Justice and Memory, Part 804, 2005, p. 140. ISBN 978-0-415-33873-8. ^ "Prologue: Selected Articles". Archives.gov. 2011-10-19. Retrieved 2011-12-24. ^ "Интерфакс-Религия: Археологи обнаружили в Смоленске храм XII века". www.interfax-religion.ru. ^ "К 1150-летию основания Смоленска отчеканили памятные монеты из драгоценных металлов". www.35kopeek.ru. ^ "Weather and Climate-The Climate of Somlensk" (in Russian). Weather and Climate (Погода и климат). Retrieved 11 April 2016. ^ "Smolensk Climate Normals 1961–1990". National Oceanic and Atmospheric Administration. Retrieved 11 April 2016. ^ "International Contacts". Targovishte Municipality. Archived from the original on August 13, 2007. Retrieved 2013-08-29. ^ Smolensk Strait. SCAR Composite Antarctic Gazetteer. Администрация Смоленской области. Постановление №261 от 30 апреля 2008 г. «Об утверждении реестра административно-территориальных единиц и территориальных единиц Смоленской области», в ред. Постановления №464 от 27 июня 2014 г. «О внесении изменений в реестр административно-территориальных единиц и территориальных единиц Смоленской области». Опубликован: База данных "Консультант-плюс". (Administration of Smolensk Oblast. Resolution #261 of April 30, 2008 On the Adoption of the Registry of the Administrative-Territorial Units and Territorial Units of Smolensk Oblast, as amended by the Resolution #464 of June 27, 2014 On Amending the Registry of the Administrative-Territorial Units and Territorial Units of Smolensk Oblast. ). Смоленский городской Совет. Решение №164 от 28 октября 2005 г. «Устав города Смоленска (новая редакция)», в ред. Решения №1419 от 29 мая 2015 г. «О внесении изменений в Устав города Смоленска». Вступил в силу со дня официального опубликования, за исключением положений, для которых установлены иные сроки вступления в силу. Опубликован: "Смоленские новости", №71, 22 декабря 2005 г. (Smolensk City Council. Decision #164 of October 28, 2005 Charter of the City of Smolensk (New Edition), as amended by the Decision #1419 of May 29, 2015 On Amending the Charter of the City of Smolensk. Effective as of the day of the official publication, with the exception of the clauses for which other dates of taking effect are specified.). Smolensk Oblast (Russian: Смоле́нская о́бласть, Smolenskaya oblast; informal name — Smolenschina is a federal subject of Russia. Its administrative center is the city of Smolensk. As of the 2010 Census, its population was 985,537. Mozhaysk is a town and the administrative center of Mozhaysky District in Moscow Oblast, Russia, located 110 kilometers (68 mi) to the west of Moscow, on the historic road leading to Smolensk and then to Poland. Population: 31,363 (2010 Census); 31,459 (2002 Census); 30,735 (1989 Census). Velizh is a town and the administrative center of Velizhsky District in Smolensk Oblast, Russia, located on the bank of the Western Dvina, 134 kilometers (83 mi) from Smolensk, the administrative center of the oblast. Population: 7,620 (2010 Census); 8,343 (2002 Census); 9,146 (1989 Census). Volokolamsk is a town and the administrative center of Volokolamsky District in Moscow Oblast, Russia, located on the Gorodenka River, not far from its confluence with the Lama River, 129 kilometers (80 mi) northwest of Moscow. Population: 23,433 (2010 Census); 16,656 (2002 Census); 18,226 (1989 Census). Vyazma is a town and the administrative center of Vyazemsky District in Smolensk Oblast, Russia, located on the Vyazma River, about halfway between Smolensk, the administrative center of the oblast, and Mozhaysk. Throughout its turbulent history, it defended western approaches to Moscow. Population: 57,101 (2010 Census); 57,545 (2002 Census); 59,022 (1989 Census); 44,000 (1970). Dorogobuzh is a historic town and the administrative center of Dorogobuzhsky District in Smolensk Oblast, Russia, straddling the Dnieper River and located 125 kilometers (78 mi) east of Smolensk, the administrative center of the oblast. Population: 10,720 (2010 Census); 12,250 (2002 Census); 12,254 (1989 Census). Rudnya is a town and the administrative center of Rudnyansky District in Smolensk Oblast, Russia, located on the Malaya Berezina River 68 kilometers (42 mi) northwest of Smolensk, the administrative center of the oblast. Population: 10,030 (2010 Census); 9,853 (2002 Census); 11,032 (1989 Census). Krasninsky District is an administrative and municipal district (raion), one of the twenty-five in Smolensk Oblast, Russia. It is located in the west of the oblast and borders with Rudnyansky District in the north, Smolensky District in the east, Monastyrshchinsky District in the south, Horki District of Mogilev Region of Belarus in the southwest, and with Dubrowna District of Vitebsk Region, also of Belarus, in the west. The area of the district is 1,507.67 square kilometers (582.11 sq mi). Its administrative center is the urban locality of Krasny. Population: 12,895 ; 15,537 (2002 Census); 18,758 (1989 Census). The population of Krasny accounts for 33.7% of the district's total population. Dorogobuzhsky District is an administrative and municipal district (raion), one of the twenty-five in Smolensk Oblast, Russia. It is located in the center of the oblast. The area of the district is 1,771.99 square kilometers (684.17 sq mi). Its administrative center is the town of Dorogobuzh. Population: 29,077 ; 32,672 (2002 Census); 36,016 (1989 Census). The population of Dorogobuzh accounts for 36.9% of the district's total population. Khislavichsky District is an administrative and municipal district (raion), one of the twenty-five in Smolensk Oblast, Russia. It is located in the southwest of the oblast and borders with Monastyrshchinsky District in the north, Pochinkovsky District in the east, Shumyachsky District in the south, and with Mstsislaw District of Mogilev Region of Belarus in the west. The area of the district is 1,161 square kilometers (448 sq mi). Its administrative center is the urban locality of Khislavichi. Population: 9,070 ; 12,007 (2002 Census); 15,071 (1989 Census). The population of Khislavichi accounts for 45.6% of the district's total population. Monastyrshchinsky District is an administrative and municipal district (raion), one of the twenty-five in Smolensk Oblast, Russia. It is located in the west of the oblast and borders with Smolensky District in the north, Pochinkovsky District in the east, Khislavichsky District in the south, Mstsislaw District of Mogilev Region of Belarus in the west, and with Krasninsky District in the northwest. The area of the district is 1,513.75 square kilometers (584.46 sq mi). Its administrative center is the urban locality of Monastyrshchina. Population: 10,788 ; 13,876 (2002 Census); 17,559 (1989 Census). The population of Monastyrshchino accounts for 37.7% of the district's total population. Roslavlsky District is an administrative and municipal district (raion), one of the twenty-five in Smolensk Oblast, Russia. It is located in the south of the oblast and borders with Yelninsky District in the north, Spas-Demensky District, of Kaluga Oblast, in the northeast, Kuybyshevsky District, also of Kaluga Oblast, in the east, Rognedinsky District of Bryansk Oblast in the southeast, Dubrovsky District, also of Bryansk Oblast, in the south, Yershichsky District in the southwest, Shumyachsky District in the west, and with Pochinkovsky District in the northwest. The territory of the town of Desnogorsk is enclosed from all sides by Roslavlsky District. The area of the district is 3,000 square kilometers (1,200 sq mi). Its administrative center is the town of Roslavl. Population: 76,100 ; 81,307 (2002 Census); 61,000 (1989 Census). The population of Roslavl accounts for 72.1% of the district's total population. Rudnyansky District is an administrative and municipal district (raion), one of the twenty-five in Smolensk Oblast, Russia. It is located in the west and northwest of the oblast and borders with Velizhsky District in the north, Demidovsky District in the northeast, Smolensky District in the east, Krasnensky District in the south, and with Vitebsk, Liozna, and Dubrowna Districts of Vitebsk Region of Belarus in the west. The area of the district is 2,111.41 square kilometers (815.22 sq mi). Its administrative center is the town of Rudnya. Population: 25,244 ; 28,037 (2002 Census); 34,724 (1989 Census). The population of Rudnya accounts for 39.7% of the district's total population. Shumyachsky District is an administrative and municipal district (raion), one of the twenty-five in Smolensk Oblast, Russia. It is located in the southwest of the oblast and borders with Khislavichsky District in the north, Pochinkovsky District in the northwest, Roslavlsky District in the east, Yershichsky District in the southeast, Klimavichy District of Mogilev Region of Belarus in the south, and with Krychaw and Mstsislaw Districts, also of Mogilev Region, in the west. The area of the district is 1,367.70 square kilometers (528.07 sq mi). Its administrative center is the urban locality of Shumyachi. Population: 10,713 ; 14,032 (2002 Census); 17,678 (1989 Census). The population of Shumyachi accounts for 39.5% of the district's total population. Smolensky District is an administrative and municipal district (raion), one of the twenty-five in Smolensk Oblast, Russia. It is located in the west of the oblast and borders with Demidovsky District in the north, Dukhovshchinsky District in the northeast, Kardymovsky District in the east, Pochinkovsky District in the south, Monastyrshchinsky District in the southwest, Krasninsky District in the west, and with Rudnyansky District in the northwest. The area of the district is 2,494.98 square kilometers (963.32 sq mi). Its administrative center is the city of Smolensk. Population: 44,964 ; 47,281 (2002 Census); 50,620 (1989 Census). Sychyovsky District is an administrative and municipal district (raion), one of the twenty-five in Smolensk Oblast, Russia. It is located in the northeast of the oblast. The area of the district is 1,803.90 square kilometers (696.49 sq mi). Its administrative center is the town of Sychyovka. Population: 14,158 ; 15,835 (2002 Census); 18,847 (1989 Census). The population of Sychyovka accounts for 57.3% of the district's total population. Velizhsky District is an administrative and municipal district (raion), one of the twenty-five in Smolensk Oblast, Russia. It is located in the northwest of the oblast and borders with Vitebsk District, Vitebsk Region of Belarus in the west, Usvyatsky and Kunyinsky Districts of Pskov Oblast in the northwest, Zapadnodvinsky and Zharkovsky Districts of Tver Oblast in the northeast, Demidovsky District in the east, and with Rudnyansky District in the south. The area of the district is 1,473.19 square kilometers (568.80 sq mi). Its administrative center is the town of Velizh. Population: 12,248 ; 14,329 (2002 Census); 17,239 (1989 Census). The population of Velizh accounts for 62.2% of the district's total population. Yelninsky District is an administrative and municipal district (raion), one of the twenty-five in Smolensk Oblast, Russia. It is located in the southeast of the oblast and borders with Dorogobuzhsky District in the north, Ugransky District in the east, Spas-Demensky District of Kaluga Oblast in the southeast, Roslavlsky District in the south, Pochinkovsky District in the west, and with Glinkovsky District in the northwest. The area of the district is 1,808.15 square kilometers (698.13 sq mi). Its administrative center is the town of Yelnya. Population: 14,948 ; 17,457 (2002 Census); 19,699 (1989 Census). The population of Yelnya accounts for 67.5% of the district's total population. Belsky District is an administrative and municipal district (raion), one of the thirty-six in Tver Oblast, Russia. It is located in the southwest of the oblast and borders with Nelidovsky District in the north, Oleninsky District in the northeast, Sychyovsky District of Smolensk Oblast in the east, Novoduginsky District of Smolensk Oblast in the southeast, Kholm-Zhirkovsky District of Smolensk Oblast in the south, Dukhovshchinsky District of Smolensk Oblast in the southwest, and with Zharkovsky District in the west. The area of the district is 2,135 square kilometers (824 sq mi). Its administrative center is the town of Bely. Population: 6,582 ; 8,125 (2002 Census); 10,005 (1989 Census). The population of Bely accounts for 57.3% of the district's total population.